"This is no time for dialogue. 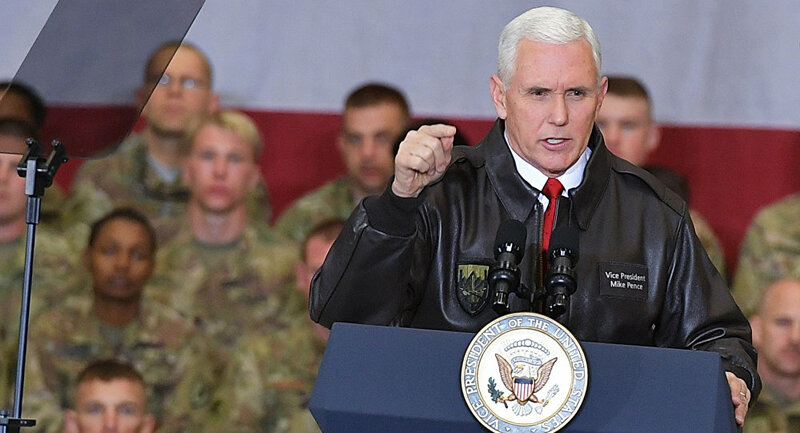 This is time for action … The time has come to end the Maduro dictatorship once and for all", Pence told a cheering crowd at a rally in Miami, Florida. During the talks with Venezuelan diplomats on Tuesday, Pence said that Washington strongly supports the country's National Assembly and self-declared interim President Juan Guaido. Moreover, Pence said in a video message earlier this week that the US government supported Guaido’s "courageous decision … to assert that body’s constitutional powers, declare Maduro an usurper and call for the establishment of a transitional government". Maduro, in turn, has slammed Pence's statement as a violation of "the rules of the game", vowing to revise relations with Washington. Another senior US official, National Security Advisor John Bolton, claimed earlier in the day that there was overwhelming support among Latin American countries for a transfer of power away from Maduro to Guaido. Bolton also claimed Friday that he and US President Donald Trump have talked several times a day about the situation in Venezuela and that there was a whole range of economic and political steps that remain to be taken, adding, however, that the Trump administration had no plans for imminent military intervention in Venezuela. Venezuela is currently going through a political crisis, with Guaido, the head of the opposition-controlled Venezuelan National Assembly, having declared himself the country's interim president on 23 January. Maduro has accused Washington of orchestrating a coup in Venezuela, since the United States and several allies immediately recognized Guaido. Russia, along with China, Iran, Turkey, Mexico and other states, has voiced support for Maduro as the only legitimate president of Venezuela. On Monday, the United States blocked all of Venezuelan state oil company PDVSA's assets in its jurisdiction and imposed a ban on making deals with the company. US Treasury Secretary Steven Mnuchin told reporters that by blocking PDVSA's assets, the United States was taking care of this company in the interests of the people of Venezuela and also protecting its own market.